Tim wrote how the British government policy document contains measures that embeds a ‘presumption to publication’ in tax-funded services and ensures easier access to public data, and that David Cameron, the Prime Minister, has made Open Data a top priority because of the evidence that this public asset can transform outcomes and effectiveness, as well as accountability. READ Tim Kelsey's guest blog post. The inventor of the World Wide Web made a guest appearance thanks to Wired.co.uk where he had posted about the results of the Open Data Research network. Sir Tim wrote that the network is bringing together researchers from the global south to explore the emerging impacts of open data in developing countries, and to better understand how it is impacting upon decision making and implementation. He mentioned the Open Up! conference held in London in November. Andreas wrote about his Democracy 2015 initiative to get a substantial number of non-politicians into the UK's House of Commons at the next general election in May 2015. As Founding Editor of The Independent newspaper, Andreas called for the press to be more involved in pushing forward the open governance agenda. DFID's Mark Robinson is a regular OGP guest blogger and in November he wrote a summary of the Open Up! conference, focusing on how realism is needed when talking about the use of new technology in government transparency. One example Mark cited was that in large parts of rural Africa, mobile phones are often used by men whereas women are the primary users of government services. He said that another barrier for governments in making public service information more accessible via mobile phones is that text services depend on good literacy levels. Leveraging policies for social change: we need to be more strategic about how OGP relates to the G20, to the UN, to other major international transparency initiatives, and use OGP to frame and launch policy innovations in the technology/open data/transparency field. Learning: OGP is a treasure trove of experiences on the government and civil society sides, how can we tap into these, share them and learn from them? 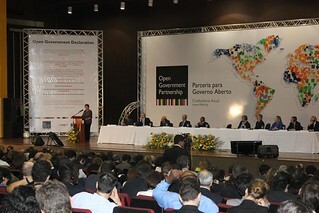 Institutional growth: we need to support the institutions/processes and people that make OGP work. What we have here effectively is a start-up multi-lateral initiative. Monitoring: the excitement of the first year is now over, OGP will need to be held account for the change it claims to achieve. We have an exciting challenge on our hands to develop the checks/balances/safeguards to ensure OGP remains true to what it was designed to be – a race to the top between reforming governments worldwide. We need to discover a new way, newer tools to take open government agenda to the people in the south. Otherwise, in countries like Nepal where communities in poorest districts still forage for food six months a year if they are to survive, releasing .CSV datasets will be as good as a white elephant on a hill. Via the blog, the OGP Support Unit or Steering Committee often ask for your help. In July, we asked for feedback ahead of the launch of the Independent Reporting Mechanism, the body now tasked with checking that countries are living up to their OGP commitments. 8. OGP Strategic Plan: Your comments? Another opportunity for the #opengov community to share their thoughts on the future of the Open Government Partnership, this time regarding the document posted below. Why is India an increasingly relevant example when making a case for open data in governance in developing countries? Joylita of ipaidabribe.com shared her thoughts on this question and wrote about how the website she works for helps people report petty or what she calls 'retail' corruption. This provides a good example of how the locating and collecting of information now doesn’t solely depend on the Indian government. Joylita wrote in August that through the platform, individuals have a role to play too and this helps to balance the role of the government and citizens. After all, opening up public sector data could generate economic gains of around €40 billion a year, and that’s not something to be ignored, especially in this economic climate. Despite Ireland’s success at attracting high-tech multi-national corporations and despite the reputation Ireland rightfully has for its quality of technical graduates, Ireland’s government remains steadfastly uninterested in the benefits of open data and open government. 4. Open data and economic growth: which link, if any? When the open government community is repeatedly talking about themes like transparency, accountability and open data, what does it mean to the citizens inside participating countries? Can the governments and civil society organisations better-explain what the impact of open government could be? When Paul Beentjes approached us with such a question on the OGP Facebook page, we did our best to answer in this blog post. Continuing the theme of explaining what open government can deliver, Alvaro posted on the blog in September, writing about a citizen-led initiative to set standards on what open, transparent, accountable and participatory government really means. After reading his guest post, please Tweet about it using the hashtag #IwantOpen. We've had many guest bloggers during our first year and we'd like to hear from more of you. Perhaps, for example, you have good open government implementation stories to share from Africa or Asia? Please pitch an idea to us via this post. We decided to tell the story of our first year visually -- and it turned out to be the most viewed blog post of the year. One section of the infographic appears below and please visit the post itself for the whole thing. Thanks for reading the blog in 2013. Don't forget that it's your blog too -- please share your stories.